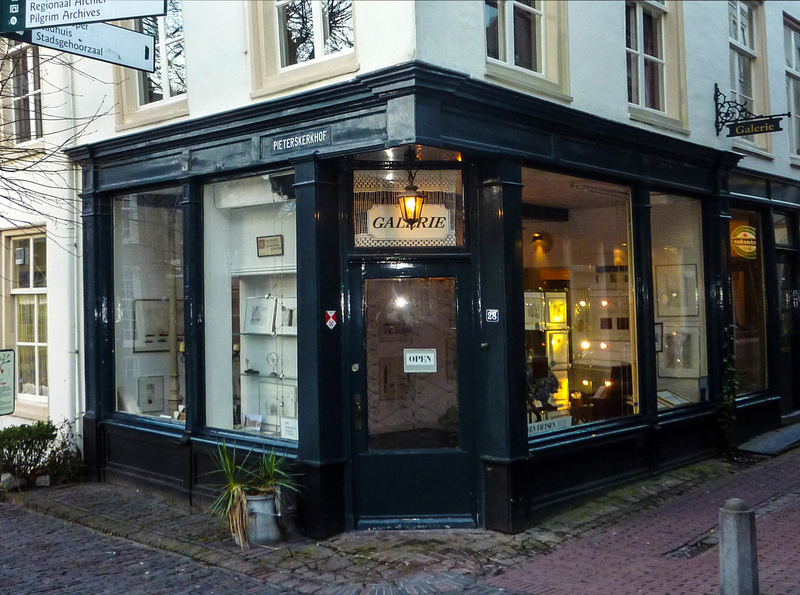 This beautiful little gallery opens on to the precinct of the Pieterskerk, one of the nicest parts of Leiden. The gallery is unusual in that it only sells etching-based prints by one artist – its proprietor Rien van der Nat. Sounds a bit like self-publishing – nobody else will take you on so you do it yourself? Well, forget that. Nat makes the most exquisite, beautifully executed etching monoprints which he produces in his studio on the premises. The technique is complex and unusual. He part etches the plate in the normal way and then adds inks to the surface of the plate to get unique, one-off prints. So, unlike normal etchings where an edition is run off, maybe 25 or 200 copies, each print on sale here is an inimitable and original. Even if he wanted to, Rien could not duplicate a print. With a few exceptions, they are all abstract designs, some putting me in mind of Antoni Tàpies, some even of Anslem Kiefer. They are mostly quite small, averaging about 25 x 30 cms and each one is a little masterpiece. And they are very reasonably priced, starting from about €30 for a very small one, up to about €300 for a large one. They all come ready mounted and you can get them framed on the premises for an extra charge. He also makes lovely little sculptures in various media.